With every passing decade, there are fewer and fewer jobs that are done without spending at least a few hours a day in front of a computer screen and the vast majority of jobs involve most of your work time spent typing, reading, and designing at a desk looking at one or more screens all day long. While this move toward digital work is great for reducing workplace injury hazards and ushering in the age of robotic labor, the lifestyle of a computer using professional is surprisingly bad for your eyes. The human eye developed for constantly changing light and tracking movement at various distances. Even if you played adventure video games all day, screens simply can’t provide the right amount of eye exercise. When your eyes refocus for close or distance, this is a muscular reaction and just like muscles that don’t exercise, they lose functionality. People who look at their screens too much without variance and using the wrong eye health techniques can turn good eyes nearsighted and further shorten the focus distance of already nearsighted people. To top it off, holding your eyes open in the air conditioning tends to dry them out which can cause further problems. To help you maintain good eye health during the long hours at the office and all those hours you spend in front of a screen at home working and recreating, here are nine helpful tips for computer screen eye care. The further away you can focus, the better it will be for your eyes. In fact, optometrists that use a holistic approach often suggest that near-sighted patients practice focusing on things that are very far away in order to stretch the eyes, like any other muscle. To minimize the vision shortening effects of constant computer use, set your monitors back as far as is comfortable and possible with your desk and chair setup. This may be easier with larger monitors and a slightly larger resolution than you might use otherwise. Your eyes need to exercise, move around, and look at various things. Before the age of computers, even people who read paperwork and used typewriters all day had to look around more to use their filing cabinets, hand-deliver messages, and keep their typewriters in good working order. Now, we can do absolutely everything with absolutely minimal eye movement. With a few small twitches of the fingers, we can create and edit, and share documents, and even design elaborate artistic projects without ever looking at anything but the screens a few feet away. To keep up the recommended amount of eye movement, take a break every hour or so to look at various things. This may be easier if you have access to a window, interesting art, or even just other screens at varying distances from you. The more variety of things and distances you look at, the better. Computer use has often brought about a comparison to lizards, specifically their unblinking gazes. Those lizards who don’t have eyelids and can’t blink have to lick their eyeballs to keep them moist and healthy. Fortunately, we were blessed with eyeball moistening eyelids and should use them regularly. When working at a computer, no matter how interesting your work is, remember to blink often and take a few extra-long blinks if your eyes start to feel dry. It may sound silly but a good blinking regime can save you from the classic overworked bloodshot eyes and the required use of medicinal eyedrops. dard eyeglass lenses. 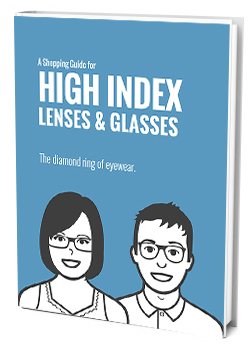 Anti-reflective high index lenses are incredibly popular among office professionals. All jobs must provide a mandatory number of breaks and some offer their employees a little more scheduling freedom as long as quota is met. At every chance you get, get up and take a walk either around the block or at least through the building. This is a great opportunity to explore your workplace and the neighborhood it’s based in. Find new things to look at with every walk in order to keep your mind interested and your eyes constantly moving from item to item, near and far away. Visit the mailroom, basement, marketing department, the landscaped grounds, the little shop down the street. Not only will your eyes get healthier, you’ll also be boosting your amount of daily exercise and discovering all the interesting things about the area in which you work. We all know that a dim screen in a bright room or a bright light in a dark room are uncomfortable to the eyes but if your screens don’t match the brightness of the room, it’s all too easy to ‘get used to it’ over the hours you’re at work. Unfortunately, this results in cumulative eyestrain over many hours and days. Make sure that your screen brightness properly matches the brightness of the room to avoid unnecessary stress on your eyes. That said, try to settle on the dimmest setting that is comfortable. 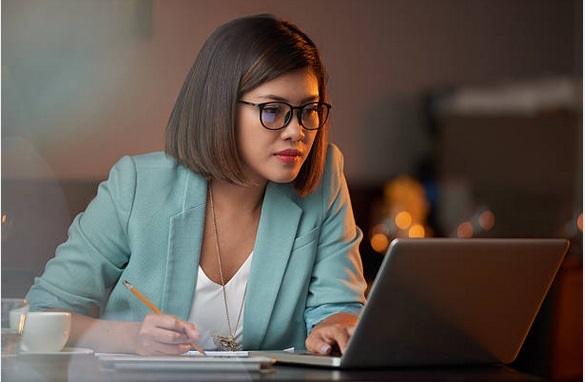 Glare on your glasses is bad enough but bright lights in the room can also result in glare coming off your computer screens. This, like bright lights in a dark room, creates an uneven light distribution in your range of vision such that your pupils cannot adjust comfortably to either the brightness of your screens or the brightness of the glare. Dust your monitors regularly with similar methods as you’d use for your glasses (don’t forget to clean the cloths) and consider an anti-glare spray. One mistake that many office workers make is wearing the wrong prescription for computer work. Normal reading glasses that you can pick up at the drug store are a bad idea because they tend to be of a generic prescription and may not even be properly centered for your eyes. Near- or far-sighted, make sure to talk to your optometrist about high index computer-range glasses and the possibility of office-optimized progressives. This will ensure that the screens are within the right focus range for your glasses, making it easier for them to look at and more comfortable to switch to other tasks. It’s easier to look down than up, which is why our eyes tend to drift downward when we’re tired. Constantly looking slightly up from your natural seated eye line all the time can wear out the muscles of your eyes and increase your risk for eyestrain. To prevent this, make sure to set your monitors slightly down from the center of your vision so you are always looking slightly down at them instead of up.